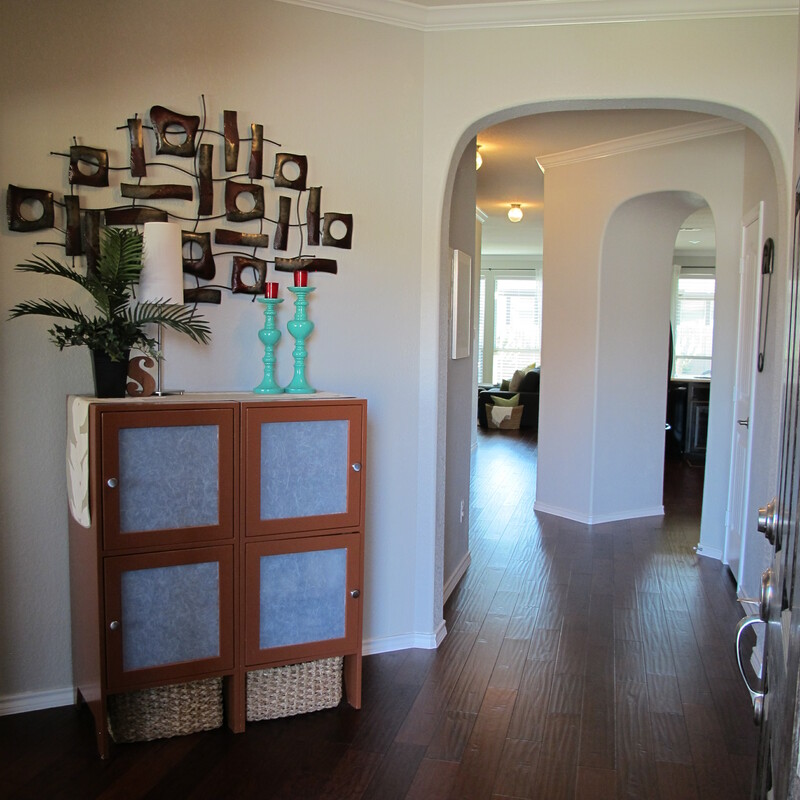 I’m happy to say that I finally got around to taking pictures of our foyer and hallway. Many changes will be happening decor-wise in these areas as time goes on, so consider these pics a starting point. 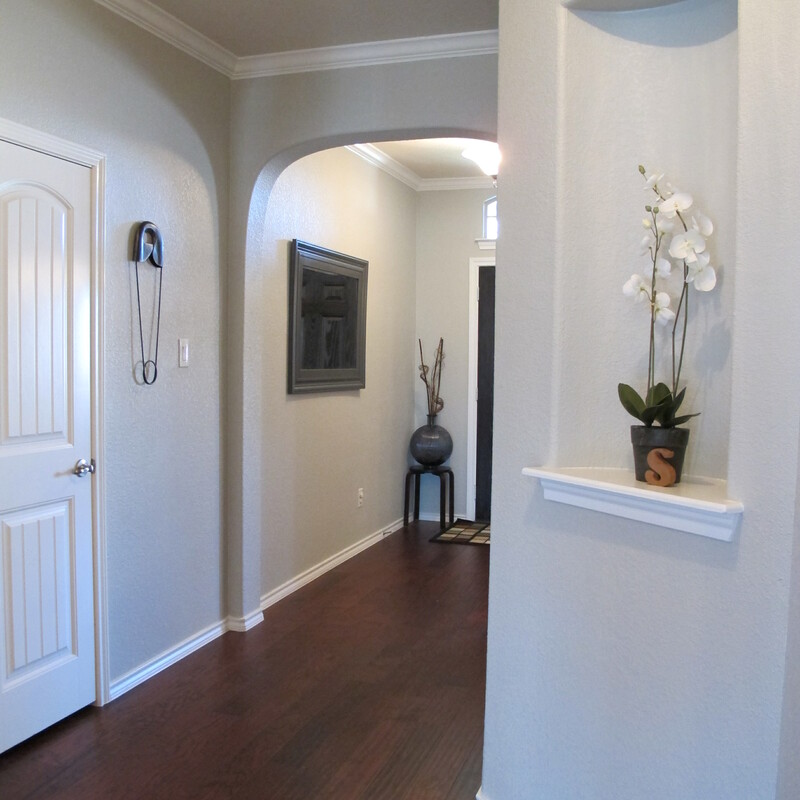 Shortly after we moved in, we painted the once beige walls in the hallway, foyer, living room and kitchen. 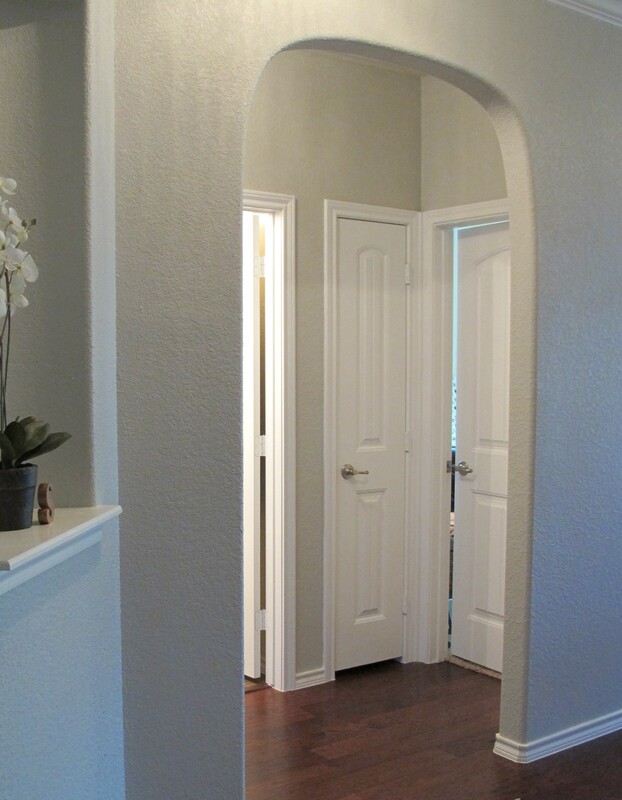 The paint is called Dolphin Fin by Behr and its a soft, pale grey with mild green undertones. I’ve come to learn that this paint color is very difficult to photograph accurately. It appears beige and/or washed out in many of the pics. Just know that in person it’s a nice, soft grey. For now, we’ve squeezed the side units from our previous entertainment center together to form a hutch of sorts for storage. It’s working out well functionality-wise, but we’d like something with a bit more character in this spot eventually. Maybe a mid-century console or sleek hutch. We’ll see what the shopping gods bestow upon us. … we have a mirror that previously resided over the couch in our old house. It was a bronze color and I spray-painted it grey. Again, this is a placeholder. It’s fine. Just not great. 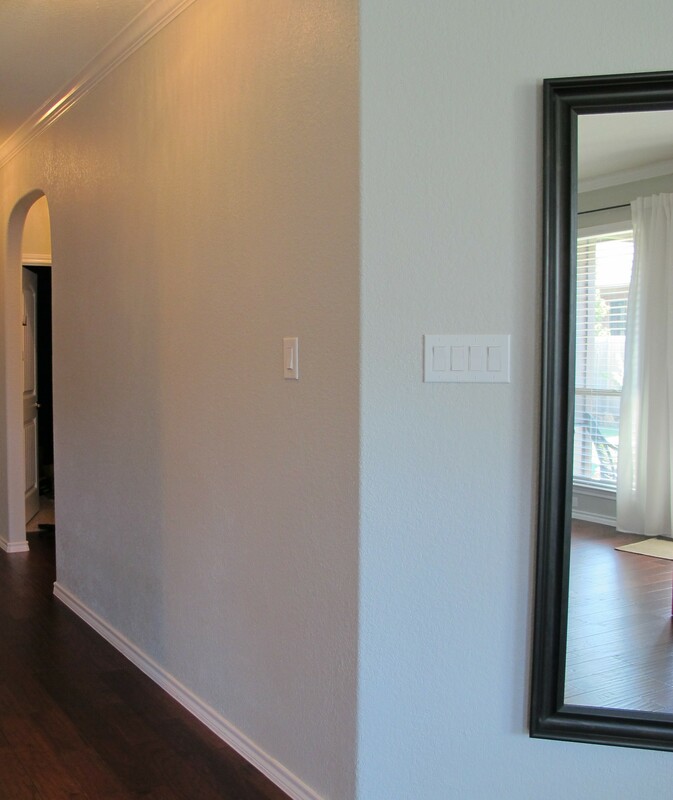 Once our master bedroom plan goes into effect (stay tuned for that), we’d like to hang the large, chunky Ikea mirror that’s leaning against our bedroom wall in this spot. It’ll provide much more of a modern presence and fill the space better. 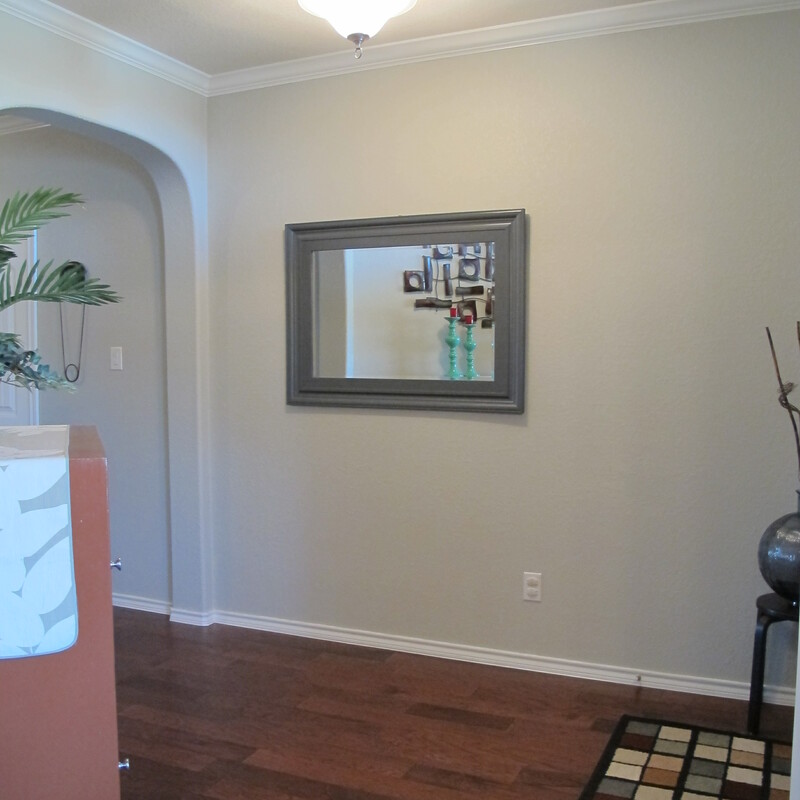 I’d like to also configure some kind of non-obtrusive drop-zone on this wall for guests to leave coats and purses. Something that looks decent when not in use, but adds function when needed. Research is definitely required in this area. Boy, I love this kind of research. May the Pinterest eye-candy commence! I’d also love to do some kind of paint treatment on these walls like stripes or stenciling, but I’ll admit that I’m a little intimidated by these prospects as our walls are textured. Again, research time! I’m sure somebody somewhere at some point has given it a go. 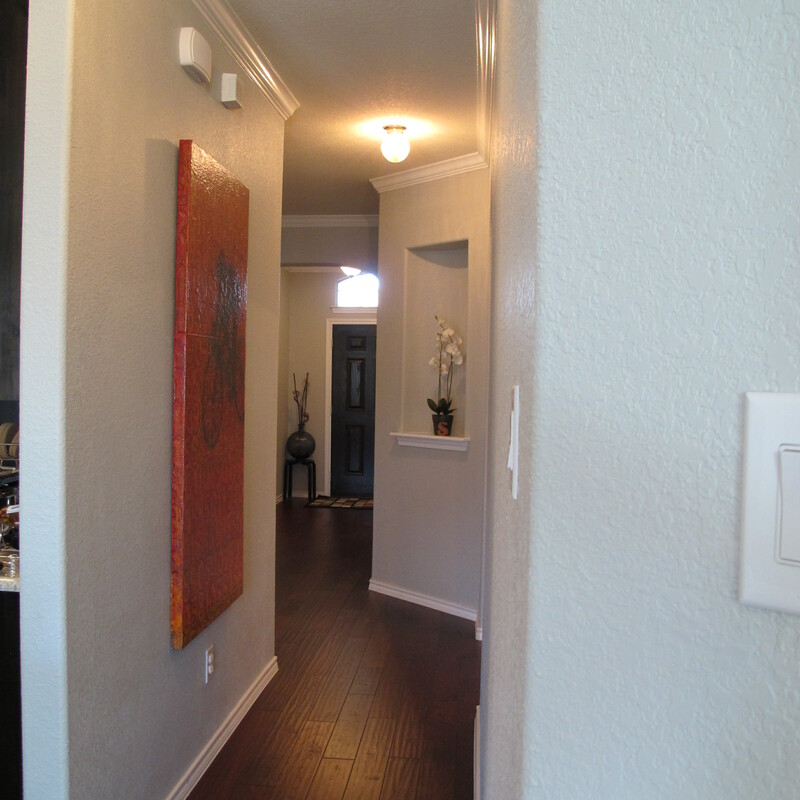 … we have an entry to the kitchen to the right. 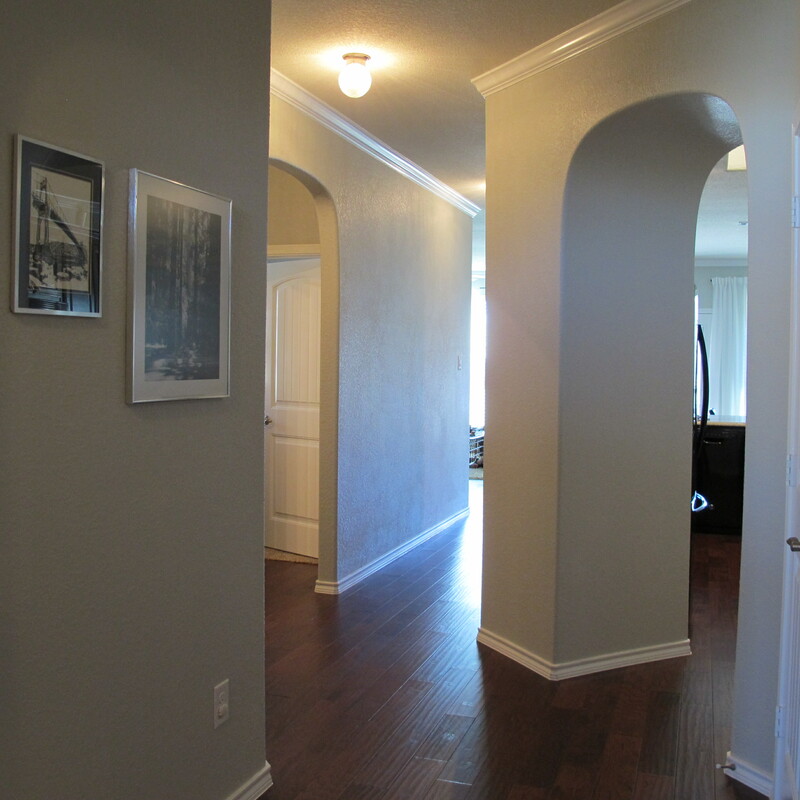 To the far left is a small hallway to the non-master bedrooms/guest bath and the hallway in between leads to the living room. 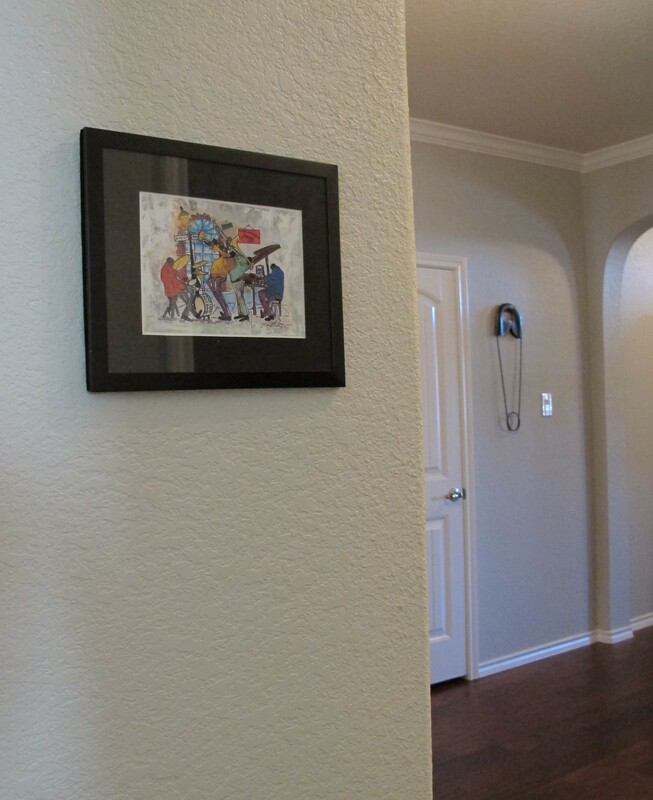 In the middle hallway on the right-hand wall, we have an awesome art piece created by my mother-in-law…. We get to gaze upon it any time we leave our small hallway which is nice. …we have an art niche housing a fake orchid and one of the wooden “S”s that Joeys parents created for the centerpieces at our wedding. There’s a coat closet across the hall . And as for the large safety pin, I found it at Hobby Lobby for 50% off and had to buy it. 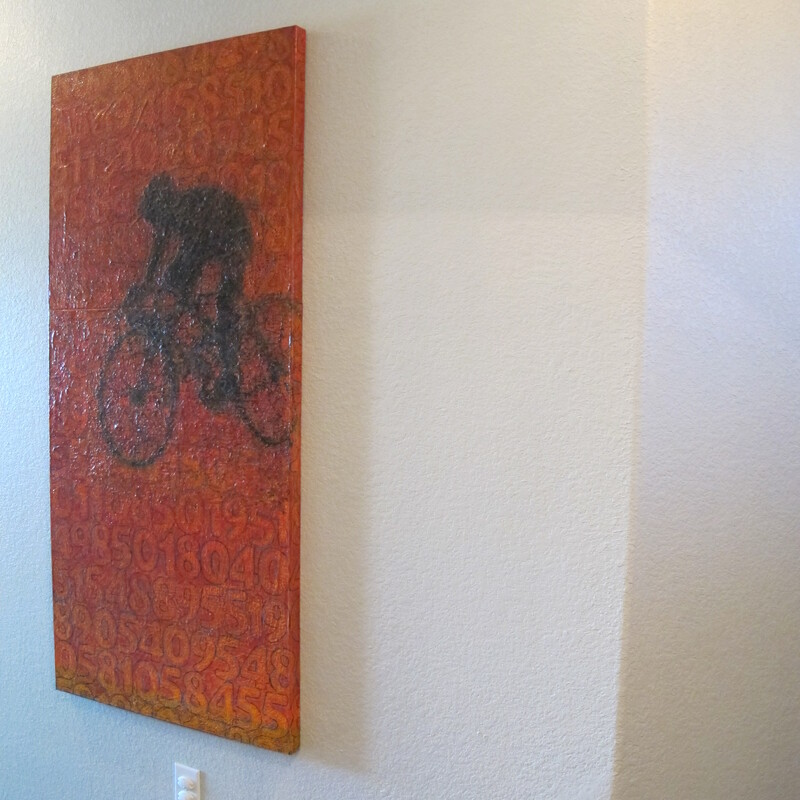 Back down the middle hall, I still have this blank wall across from my mother-in-law’s painting to contend with…. I have an idea for it, but have yet to come across the supplies I need to make my plan come to fruition. Eventually it’ll happen, though. No doubt. 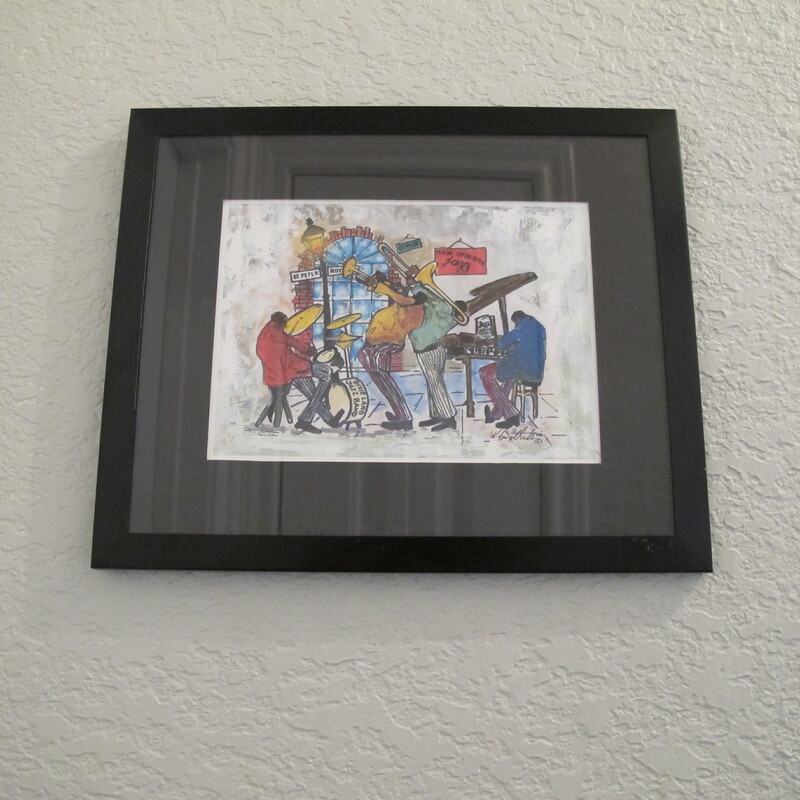 The other side holds a fun jazz print that I purchased in the French Quarter of New Orleans when I was going to school in Louisiana…. Changes are definitely abrewin’ in these areas shortly. Hopefully, I’ll get ’em done and posted about soon. Love all your ideas & can’t wait to see what you come up with! 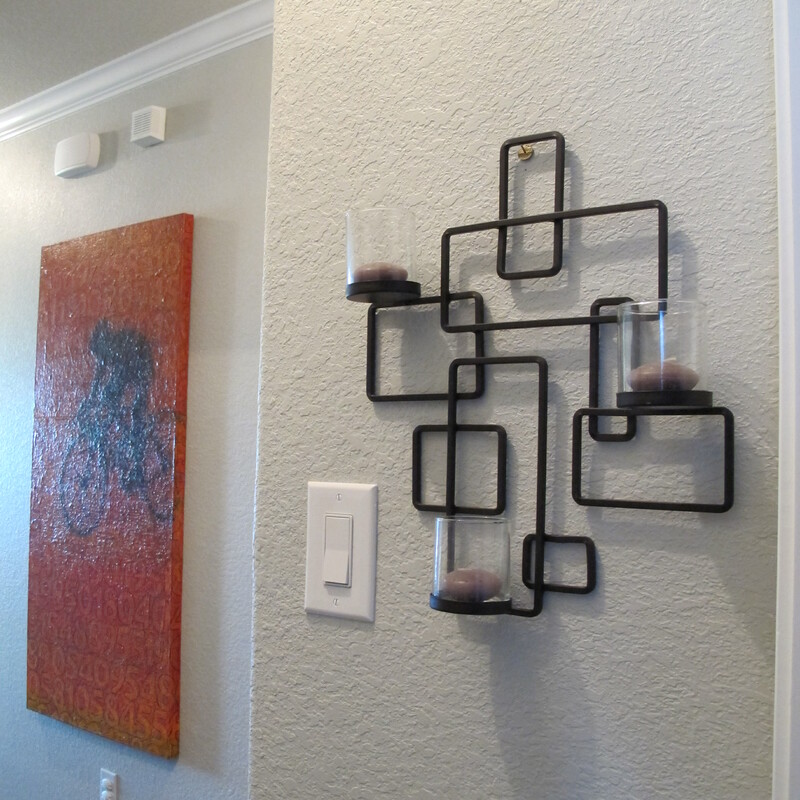 I would love to know where you got the black candle holder in your foyer. It looks amazing and is the exact style I am aiming for in my living room. Wonderful job and beautiful home overall. Okay Thanks, I will give Bed Bath and Beyond a look and hope to find one. Congrats on your beautiful home as I just purchased my first home two weeks ago so am working hard to get it all in order. Thanks for the quick response and best wishes! Same to you and congrats on your new home!